Every profession has its own jargon and the Navy is no exception. For the Navy, it’s bulkhead, deck and overhead and not wall, floor, and ceiling. Some Maritime terminology has found its way into everyday use, and you will find the origins of this and Navy terminology below. More terminology will be added from time to time. Adrift – Something out of its assigned place. All Hands – Everyone in a particular unit. Between the Devil and the Deep – In wooden ships, the “devil” was the longest seam of the ship. It ran from the bow to the stern. When at sea and the “devil” had to be caulked, the sailor sat in a bo’sun’s chair to do so. He was suspended between the “devil” and the sea . the “deep” . a very precarious position, especially when the ship was underway. Boondockers – Marine slang for field boots. Crow’s Nest – The raven, or crow, was an essential part of the Vikings’ navigation equipment. These land-lubbing birds were carried on aboard to help the ship’s navigator determine where the closest land lay when weather prevented sighting the shore. In cases of poor visibility, a crow was released and the navigator plotted a course corresponding to the bird’s flight path because the crow invariably headed towards land. The Norsemen carried the birds in a cage secured to the top of the mast. Later on, as ships grew and the lookout stood his watch in a tub located high on the main mast, the name “crow’s nest” was given to this tub. While today’s Navy still uses lookouts in addition to radars, etc., the crow’s nest is a thing of the past. Deck – Floor or ground. Dity bag – Small container used to store personal items. Eight Bells – Aboard Navy ships, bells are struck to designate the hours of being on watch. Each watch is four hours in length. One bell is struck after the first half-hour has passed, two bells after one hour has passed, three bells after an hour and a half, four bells after two hours, and so forth up to eight bells are struck at the completion of the four hours. Completing a watch with no incidents to report was “Eight bells and all is well.” The practice of using bells stems from the days of the sailing ships. Sailors couldn’t afford to have their own time pieces and relied on the ship’s bells to tell time. 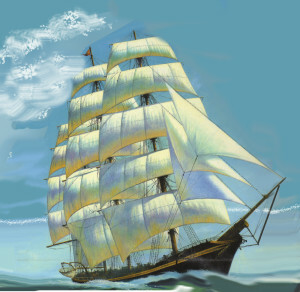 The ship’s boy kept time by using a half-hour glass. Each time the sand ran out, he would turn the glass over and ring the appropriate number of bells. Feeling Blue – If you are sad and describe yourself as “feeling blue,” you are using a phrase coined from a custom among many old deepwater sailing ships. If the ship lost the captain or any of the officers during its voyage, she would fly blue flags and have a blue band painted along her entire hull when returning to home port. Field Day – Period of time devoted clean up duties only. Galley – The galley is the kitchen of the ship. The best explanation as to its origin is that it is a corruption of “gallery”. Ancient sailors cooked their meals on a brick or stone gallery laid amidships. Gear – General term for equipment, supplies, materials, or baggage. Head – The “head” aboard a Navy ship is the bathroom. The term comes from the days of sailing ships when the place for the crew to relieve themselves was all the way forward on either side of the bowsprit, the integral part of the hull to which the figurehead was fastened. Holystone – The last Navy ships with teak decks were the battleships, now since decommissioned. Teaks, and other wooden decks, were scrubbed with a piece of sandstone, nicknamed at one time by an anonymous witty sailor as the “holystone.” It was so named because since its use always brought a man to his knees, it must be holy! Mayday – “Mayday” is the internationally recognized voice radio signal for ships and people in serious trouble at sea. Made official in 1948, it is an anglicizing of the French m’aidez, “help me”. P.O.D. – Plan of the day, schedule of day’s routine and events posted daily and is required reading for all hands. S.O.S. – Contrary to popular notion, the letters S.O.S. do not stand for “Save Our Ship” or “Save Our Souls”. They were selected to indicate a distress because, in Morse code, these letters and their combination create an unmistakable sound pattern. Watches – Traditionally, a 24-hour day is divided into seven watches. These are: midnight to 4 a.m. [0000-0400], the mid-watch; 4 to 8 a.m. [0400-0800], morning watch; 8 a.m. to noon [0800-1200], forenoon watch; noon to 4 p.m. [1200-1600], afternoon watch; 4 to 6 p.m. [1600-1800] first dog watch; 6 to 8 p.m. [1800-2000], second dog watch; and, 8 p.m. to midnight [2000-2400], evening watch. The half hours of the watch are marked by the striking the bell an appropriate number of times.